If you’ve ever had to give your pet medication, you’ll know this apparently simple task is easier said than done. Many challenging canines make a habit of wriggling away or spitting the tablet out. You might try tucking the pill away in an appealing piece of food, but thanks to dogs’ incredible sense of smell, sometimes even this old favorite doesn’t do the trick. If this sounds like a problem you’ve encountered before, a pet pill shooter could be the solution for you. These handy devices shoot pills directly into your dog’s mouth, allowing you to administer their medicine quickly and without stress. There are a whole host of pill shooters for dogs on the market right now, so we’ve sorted the wheat from the chaff, and brought you a list of what we believe are the best about. We’ve also answered some common questions about how to use these devices safely and effectively, so both you and your pet can stay happy and healthy. Kruuse’s tablet syringe is a fast and easy way to administer pills and capsules to both cats and dogs. The finger and thumb rings makes it easy to hold in place, whilst you can rest assured the pill will be securely gripped by a rubber tip, and won’t go flying away. Simply fill the syringe with water, secure the pill in the grip, open your pet’s mouth, and pull back and release the trigger. The pill will shoot into the back of their mouth, with the water to chase it down, making them swallow compulsively and ingest the medication with minimal fuss. The length of the syringe also allows you to keep your fingers away from a potentially hostile mouth, and minimise distress for everyone involved. Because the syringe shoots water too, any risk of the pill becoming lodged in your pet’s throat is minimised, since the liquid helps to wash it down. 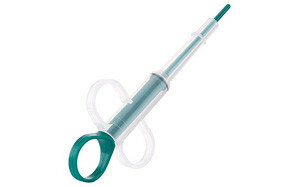 This feature also makes the syringe a great option for administering liquid medication – it’s a versatile solution that makes giving your cat or dog their medication a breeze. Jorgensen have earned themselves a spot on our list with their easy-to-use and highly cost-effective pill pusher for dogs. Its soft rubber tip holds pills and tablets securely in place, whilst still being gentle on your dog’s mouth. The tip is also secured to the rest of the device very firmly, so you won’t have to worry about it shooting off into your dog’s mouth along with the medication. The simple design is also easy to clean, so it’s easy to use again and again. Since this shooter doesn’t hold water, it’s recommended that owners keep a 10ml syringe of water on hand to help chase the pill after it’s been administered. Customers say that the pill dispenser is easy to grip, and quick to use, saving both them and their pets a lot of stress. The smaller size of this pet piller makes it a great option for petite pets, too – including cats, who can be notoriously reluctant when it comes to taking their medicine. 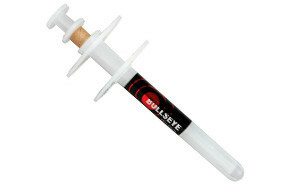 Butler’s ‘Bullseye’ dog pill shooter does exactly what its name promises, by shooting medication easily and accurately into your dog’s mouth. The pill shooter is one of the most durable on the list, constructed from high quality plastic that’s designed to last. The pill holder itself is also large enough to accommodate multiple pills and tablets, making it a great option for pets who need to take two or more pills. Delivering more than one pill at once cuts down on the time required to medicate your dog, which helps to reduce their stress as well as yours! Pills and tablets are held in a semi-hard plastic container at the tip of the syringe, which is firm enough that they won’t fall out, yet soft enough not to shatter them as they’re shot into your pet’s mouth. Like the previous shooter, this one won’t hold water behind the pills, so it’s a good idea to keep some on hand to help your pet wash down their medication. Dan Diao’s pack of two dog pill shooters represents excellent value, and provides owners with a backup option should one go walk about. The dispenser is suitable for use on both cats and dogs, and makes administering pills and tablets considerably less stressful. It features easy to gip finger and thumb rests which make holding the shooter in place easy and convenient. This particular dog pill giver is generally a better option for larger tablets, since smaller ones could potentially fall out of the barrel. Alternatively, this problem can be easily overcome by placing smaller pills into empty gelatine capsules. These can also make powdery tablets easier to swallow. Because of its size, Dan Diao’s pill dispenser for dogs is a great option for larger breeds, such as Labradors and German Shepherds. This also means you can keep your fingers safely out of the way when carrying out the essential but unpleasant duty of giving medication to a larger animal. Mikki’s 7.7 inch pill shooter is the perfect solution for getting small and medium sized pets to take their medication. It’s long enough to allow you to keep your hands safely away from those threatening teeth, without being too long for use on cats. Its soft rubber end means it can be inserted quite far into your pet’s mouth without causing them any pain, and minimum discomfort, whilst also lining up the barrel perfectly for shooting the pill into exactly the right spot. Because the syringe is so narrow, it will comfortably hold smaller pills to, and is less likely to make pets gag than wider options. It’s also very quick to use – in many cases your pet will have swallowed their pill before they know it! It’s also easy to wash, and is durable enough to hold up to daily use. It’s the perfect option for sneaky pets who can separate pills from pieces of food. Again, we recommend keeping water near-by to help your pet wash down their pill or tablet. The more comfortable the medicating experience, the less reluctant your pet will be to repeat it in the future! This option is recommended for use with medium and large dogs only – its larger than average barrel would not be comfortable for smaller dogs and cats to use. This size also makes it better suited to use with bigger pills – smaller tablets may need to be housed in an empty gelatine capsule to prevent them from falling out of the prongs which hold pills in place at the tip of the dispenser. Unlike some lower quality pill dispensers, GMS’ product actually shoots the pill from the barrel into the back of your pet’s mouth, rather than simply letting it fall there. This means you don’t have to push the device so far into your pet’s mouth to achieve the same results, which means far less discomfort for them, and a quicker, more convenient medication process for you. Customers also report that the top of this shooter is sealed well enough to handle pills prone to crumbling, preventing pieces from getting lost so your pet gets their proper dose. Great BBA have carefully designed their pill dispenser for use on smaller animals. Its barrel is narrow enough to be comfortably inserted into your pet’s mouth, but wide enough to hold most sizes of pill and tablet. Really large pills may need to be split in half to fit into the device’s pronged tip, but for animals with smaller mouths, cutting bigger pills in half may already be necessary. The pill shooter’s tip is constructed from soft but durable rubber, which is also environmentally friendly, whilst the rest of the barrel is made from harder sturdy plastic. It’s also light-weight and easy to maneuver, so you can negotiate it into position in your pet’s mouth without hassle. Its simple but effective design is also easy to take apart for convenient cleaning between uses. Four Paws’ pill shooter has been designed by veterinary professionals to help take the stress out of giving your dog medication. Suitable for both cats and dogs, the shooter features ergonomic finger and thumb rests, and a barrel which is narrow enough for the mouths of smaller animals, but wide enough to accommodate most pills and tablets. The ‘pincers’ at its tip grips pills and tablets effectively, meaning they won’t fall out before you get a chance to pop the dispenser into your pet’s mouth. This makes getting everything into position a far easier task! At less than $5, the shooter is also a really cost effective way to give your dog their medication safely and accurately. Its sturdy plastic is also durable enough to last and last through multiple doses – perfect for households with more than one pet on medication. Overall, this product is recommended by veterinarians for good reason! Giving dogs pills can be a real challenge, so we hope our list of pill shooters helps you to find a humane and sustainable solution. Effective as these devices can be, however, they take a little practise to get the hang of. That’s why we’ve put together a brief guide on how to safely use these devices, what to look for in a quality pill shooter, and how to get the most out of them. Larger dogs generally have larger mouths, so you may need to purchase a pill shooter with a longer reach or a broader barrel. Making sure you have the right sized shooter will make the process far more comfortable for both parties. If your pet is not currently on medication, and you’re buying a pill shooter for occasional use, chances are you’ll encounter pills and tablets in a variety of sizes. In this instance, it’s a good idea to buy a shooter which can accommodate larger pills. Smaller ones can be made to fit by placing them in an empty gelatine capsule. For dogs who need to take multiple pills, choosing a shooter which can accommodate more than one at a time is generally best. This means you’ll need to give your dog fewer doses, saving both time and stress for you and your pet. If your dog needs to take a mixture of liquid and tablet medications, choosing a shooter which can accommodate both is a good idea. This kind of device can also help to wash down pills safely, and remove the necessity of keeping a separate syringe of water on hand. Using a pill shooter helps keep your hands away from sharp teeth, preventing a potential trip to the emergency room. Using a pill shooter makes giving your pet their medication much quicker than trying to pill them by hand. Since using a pill shooter is quick, they can reduce the stress of medication time for both you and your furry friend. With a pill shooter, you know for sure that the pill has been ingested and not spat out. When pills are wrapped in treats or hidden in food, dogs can quickly learn to eat the food and leave the pill – pill shooters prevent this from happening. Pill shooters can also be used to give cats their pills – a very useful feature when we consider the feline tendency to avoid pills at all costs! Q: What is a dog pill shooter? A: A dog pill shooter (also called a pet piller, pill dispenser, or pill gun) is a small syringe-like device which, as its name suggests, shoots pills into your dog’s mouth. It can be used on many domestic animals, but dogs and cats are the most common. Pill shooters work by launching or dropping pills far enough into your pet’s mouth that they reflexively swallow them. With practise, this process can be made very quick, and is often over before the animal quite realises what has happened. Pill shooters can be used both by veterinary professionals and by owners at home. Q: Is a dog pill shooter safe to use? A: Provided you use the device correctly, yes, pill shooters are perfectly safe to use on both dogs and cats. One common concern among owners is that shooting a pill into their pet’s mouth may trigger choking; this is not the case, however. The mouths and throats of cats and dogs are not quite the same as ours, and choking is far rarer. When the pill lands at the back of their mouth, your dog will reflexively swallow, so the pill cannot go ‘down the wrong way’. As long as you give your canine companion a drink after using a pill shooter, the pill will safely make its way into their stomach to be metabolized. Another concern about pill shooters is that they can be uncomfortable for pets. Unfortunately, for pets who won’t take their pills hidden in pieces of food, a little discomfort is inevitable – but clearly better than not taking their medication at all. As long as you choose a pill shooter that’s appropriately sized for your pet’s mouth and that has a soft tip, discomfort will be minimized. Q: How do I properly use a dog pill shooter on my dog? Load up the pill shooter. This process differs from shooter to shooter, but will usually involve either working a pill into a set of ‘pincers’ at the tip of the device, or removing the plunger and dropping it in the top. Position your dog. Have them lie or sit somewhere where they’re comfortable, before gripping the back of their muzzle with between your thumb and fingers and tipping their head backwards so that their jaw opens. With your other hand, insert the pill shooter into your dog’s mouth, and depress the plunger when it is positioned at the back. With the same hand, gently close your dog’s mouth. You may need to stroke their throat to encourage swallowing. Q: What kind of pills can I use with a dog pill shooter? A: Any pills can be used with a pill shooter, but for particularly large or small ones you may need to get creative. For pills that are too small for your shooter to grip, try purchasing empty gelatine capsules to place them in, increasing their size. For pills that are too large, split them in half or quarters, or grind them up before placing them in an empty gelatine capsule. These capsules not only help with an sizing issues, but also help mask the unpleasant smell of medication to a dog’s sensitive nose. 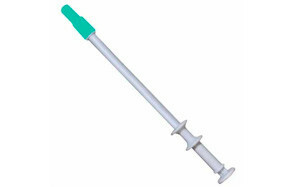 We think that the best dog pill shooter on the market right now has to be Kruue’s tablet syringe. The device not only allows you to deliver a wide variety of pills and tablets to your dog safely and effectively, it’s also carefully designed for comfortable use. The fact that the syringe can also deliver water means that pills are washed down comfortably, and that liquid medications can also be delivered without needing to purchase a separate device. The soft rubber tip holds pills firmly in place without causing discomfort to your pet’s mouth, making this product an easy to use and humane solution for dog’s who put up a fight when it comes to taking pills.